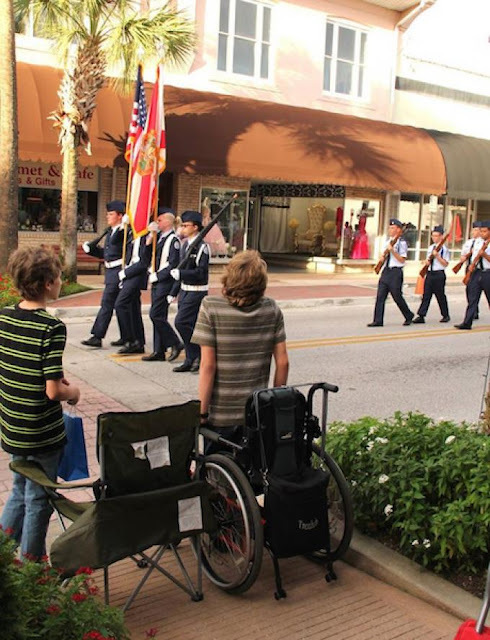 A photo spreading on social media shows a Florida teen, who is in a wheelchair due to a congenital condition, rising up for the American flag. Arek Trenholm, 16, last stood on his own seven years ago. The teen has spina bifida, which affects the development of the backbone and spinal cord. He’s had the condition since birth. “Actually, before he was born, we knew that he had the spina bifida,” Arek’s uncle, Myron Leggett told WOFL. Leggett, a professional photographer, was with Arek and his little brother watching the local high school’s homecoming parade in Leesburg when something amazing happened. “Here come the junior ROTC, marching along and chanting, and I heard… ‘He’s standing!’ and I knew what he was standing for, in an instant,” Leggett said. Because Arek can’t actually stand on his own on his legs, he used his arms to hold himself up for the flag. Leggett captured the moment on camera. Arek Trenholm, 16, last stood on his own seven years ago. The teen has spina bifida, which affects the development of the backbone and spinal cord. He’s had the condition since birth. “Really made you proud of him, and what he was doing,” Leggett said. Leggett, feeling proud, posted the photo on his Facebook page. “He’s making that effort, where so many… that have legs, that could stand, are sitting or kneeling, and not using their ‘well legs’ to stand and respect those who have fought and died for our flag and for our country,” Leggett wrote in his Facebook post. The post quickly went viral, reports Newsiosity. Arek spoke briefly to WOFL about the photo. He explained why he felt like he wanted to stand. “I didn’t want to be disrespectful, and I always stand up when … they do the flag,” Arek said.